“Hotel Reytan - unlimited access to the internet! Reytan Hotel offers an european standard connected with Polish tradition and hospitality. Hotel is located close to the center of Warsaw, in a quiet area Mokotów near the main roads of the city - the street Puławska, Łazienkowska and subway, near Łazienki Park, Belvedere Palace, museums and theaters, diplomatic missions, government offices and universities (including University of Warsaw, Warsaw School of Economics). 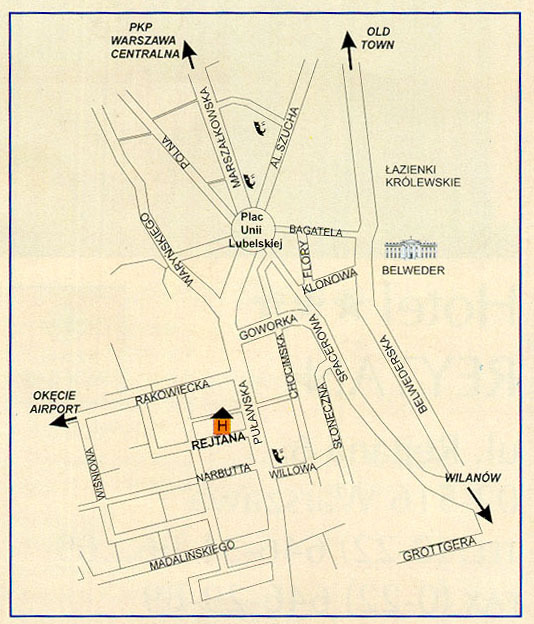 International Warsaw Okęcie Airport is just 7.5 km away, while the Central Railway Station (Dworzec Centralny) is a mere 2 km from the hotel. Hotel offers 86 rooms with bathrooms for 162 people. All rooms are equipped with satellite TV, telephone, radio, minibar, hair dryer in the bathroom and free wireless internet access. Hotel restaurant "Reytan" offers traditional Polish and international cuisine. On request we offer laundry service, room service, secured parking (paid). Hotel offers three conference halls - all are air conditioned, professionally equipped, with access to daylight. For non-smokers Guests we provide separate floors. For students, families with children and newlyweds we offer an attractive special offers. and: Polcard, Visa Electron, JCB, Diners Club International. The average cost of dinner is PLN 50. Full board is 100 PLN per person. You can get to the hotel by trams no. : 4, 18, 19, 35, and buses no. : 117, 122, 130, 131, 301, 505, 519, 522, 501, 138 or by taxi. From the Warsaw Central Railway Station the tram no. 19 leaves for the hotel as well as buses: 130, 131, 519, 407 and a night bus 607. From the airport bus no. 175, 182 ( with the transit in the centre-to the other buses mentioned above) leaves for the hotel.